The Meteorological Service of Singapore has launched a new real-time Lightning Information on the Internet. The lightning information service will be available on the MSS website via a link from the National Environment Agency (NEA) website at http://online.weather.gov.sg/lightning/. 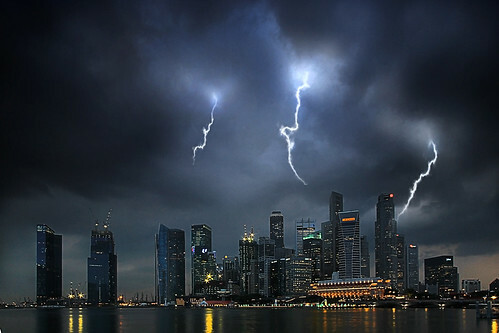 Singapore has one of the highest occurrences of lightning activity in the world. Lightning strikes are a potential safety hazard for anyone engaging in outdoor activities in Singapore. On average, Singapore experiences 167 thunderstorm days per year. This refers to the number of days in which thunder is heard over Singapore, and gives an indication of lightning activity (as thunderstorms are associated with lightning). Thunderstorms tend to occur between 2 pm and 6 pm in the afternoon as diurnal heating and convection play an important role in thunderstorm development. More thunderstorm days are observed during the Inter-Monsoon months of April, May, October and November. So a visitor to Singapore can expect a 45% chance of experiencing a thunderstorm day when visiting the country. Not too long ago, NEA also launched a Flood (Ponding) Information on the Internet.